The Schools That Can Forum is an annual, public conference that brings together top urban educators from STC schools, innovative educational organizations, thought leaders, industry, and the community to further STC’s mission of reimagining education through real-world learning. 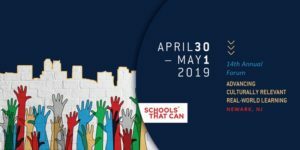 The 14th Annual Schools That Can Forum will be hosted by STC Newark and will take place on April 30 – May 1, 2019. This year’s theme is “Advancing Culturally-Relevant Real-World Learning.” Forum attendees will be treated to two days of panels, interactive workshops and school study tours that highlight practices related to Real-World Learning. See the full agenda here. Forum attendees will also participate in Schools That Can’s Annual Awards Luncheon, which includes the Leaders That Can Awards and the Robert F. Kennedy Urban Education Awards, presented in partnership with RFK Human Rights. Stay tuned for more details on speakers and session. A block of rooms is being held until April 1 at the Tryp Wyndham Hotel in Newark. Go to http://bit.ly/Schools-that-can to reserve your room.